I love this crucifix. Words really cannot even begin to express how much I adore it. I have one for my home and one I keep in my classroom as a CCD instructor. No other crucifix captures so beautifully the sacrifice of the Triune God while still managing to capture the sacrifice of Our Lady. 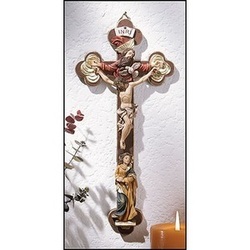 This crucifix is simply beautiful. It's made of resin and is about 13" tall. A brilliant piece of art for any home. Can be ordered from The Catholic Company.